The area of the modern nation of France was known to the Romans as 'Transalpine Gaul', meaning 'land of the Celts on the far side of the Alps', as opposed to 'Cisalpine Gaul' which was the name given to the Celtic lands of Northern Italy. Rome began to have territorial ambitions in Transalpine Gaul after the final defeat of Carthage in the Third Punic War in 146 BC. 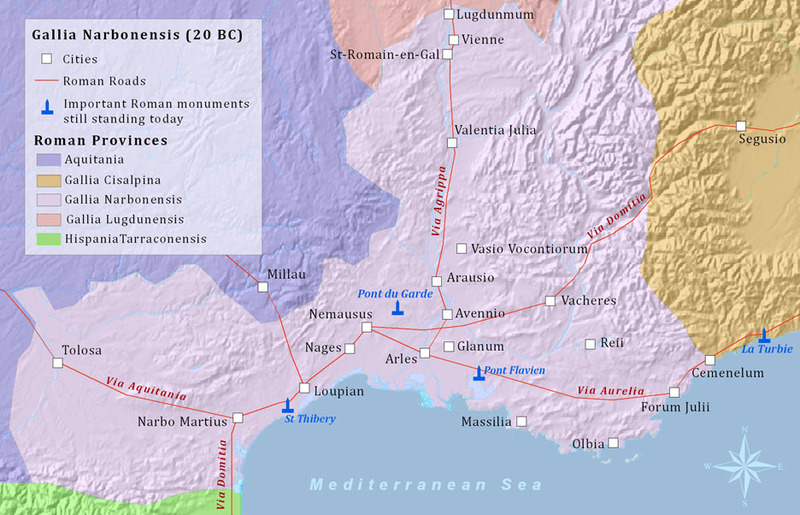 At first, Rome's primary interest in the area was to connect mainland Italy to its territories in Spain that it had acquired in its wars with Carthage. In 125 BC, Massilia (Modern Marseilles), a Greek city on the Mediterranean coast of Transalpine Gaul, requested assistance from Rome in her struggle with the Celtic tribes of the interior. Rome answered the call and by 120 BC, she had occupied the entire area of the Mediterranean coast of Transalpine Gaul, whilst allowing the Greek city of Massilia nominal independence for a time. The Romans called the area Provincia Nostra ("our province") or simply Provincia ("the province"), being one of the first significant permanent conquests outside the Italian peninsula. The name has survived in the modern French name of the region of Provence. As Rome began to acquire more and more provinces all over the Mediterranean, the confusing name of 'Provincia' was replaced with 'Gallia Transaplina'. According to Strabo, it was Augustus that finally settled on a third name for the province: 'Gallia Narbonensis', after the newly established capital of the province - Narbo Martius (Modern Narbonne). Narbo Martius was originally established by the Romans to compete with the rich Greek city of Massilia and to shift the main trade arteries away from the Rhone River valley. Whilst Massilia was eventually incorporated into the Roman Empire, the Rhone River Valley remained the focal point of urban life in Gaul Narbonensis. The Cities of Massilia, Nemausus (modern Nimes), Arelat (modern Arles), and Arausio (modern Orange) all flourished in this area. The Romans invested heavily in massive monuments, engineering projects, and amphitheatres in Gallia Narbonensis, many of which can still be seen today, such as the Pont du Gard Aqueduct, and the amphitheatres at Nimes and Arles. Beginning in the second half of the 5th century, as Roman power waned, successive waves of Germanic tribes invaded the area; first the Visigoths (480 AD); then the Ostrogoths; then the Burgundians; and finally the Franks in the 6th century. This period of instability saw the population of major cities drop dramatically, much of the infrastructure that the Romans had invested in began to crumble. The Roman monuments that survived, such as the amphitheatres and aqueducts, would have stood as a testament to the affluent days of the past.